Who was Mary Baker Eddy? This remarkable woman has been described as a healer, an author, a publisher, religious leader and a reformer. There has been a renewed interest in Mary Baker Eddy and all that she has contributed and accomplished through her life’s work. She was recently honored in the National Women’s Hall of Fame. A traveling exhibit on her life has toured cities in the U.S., and a new biography of her life, Mary Baker Eddy by Dr. Gillian Gill, was recently published, adding to the numerous biographies already available. 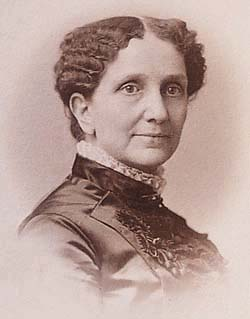 Mary Baker Eddy authored seven inspirational poems which are included in the Christian Science Hymnal. You may read these poems, and listen to music from her hymns on this site. At the time, the people around her never dreamed she would eventually write a book that would heal millions of people through the reinstatement of the healing method used by the master Christian, Christ Jesus. Nor could they have imagined that she would found a church with branches around the globe, establish several magazines, and launch an international newspaper.”Yet that’s exactly what she did, and at a time when women were generally expected to be followers, not leaders. The Mary Baker Eddy Library, opened in 2002, is home to interactive exhibits and displays that explore the life and achievements of Mary Baker Eddy. This New England woman defied conventional 19th-century thinking to become an influential religious leader, author,teacher, and founder of The Christian Science Monitor. Mary Baker Eddy’s main work was Science and Health with Key to the Scriptures. Read it on-line. She did a wonderful, an extraordinary work in the world and there is no doubt that she was a powerful influence for good.